A challenging but really fun three Col loop, with two of the Cols not really designed for bikes. A mid-November heat wave meant we decided to get up high. A challenging but really fun three Col loop, with two of the Cols not really designed for bikes. 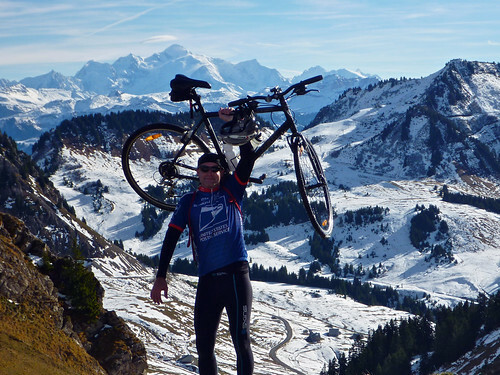 Our first goal was to cycle up Col de la Ramaz. We’d watched the Tour de France here in July and there is still plenty of Tour graffiti on the road. But it’s quieter and prettier with snow. 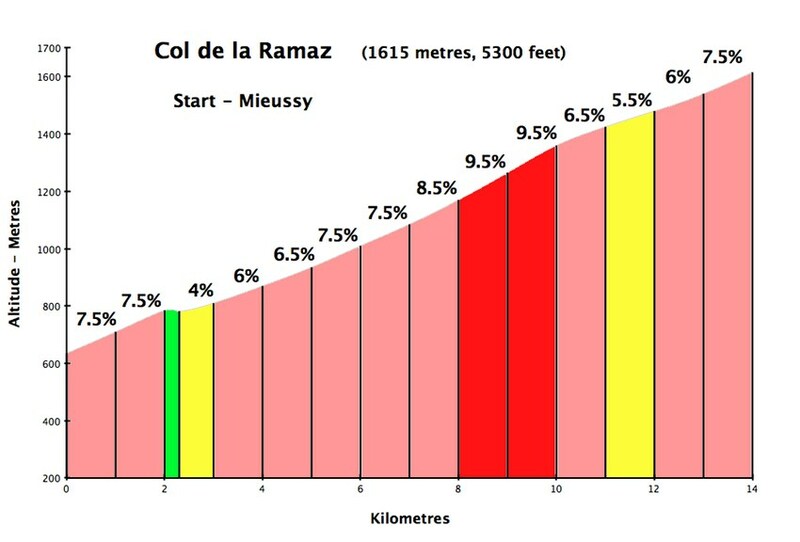 The climb profile is just for Col de la Ramaz – which is do-able with a road bike. Note, the other two Cols are not paved and often extremely steep. Descending from Ramaz for little more than a km, we took a gravel farm road that heads up to Col de Chavan. 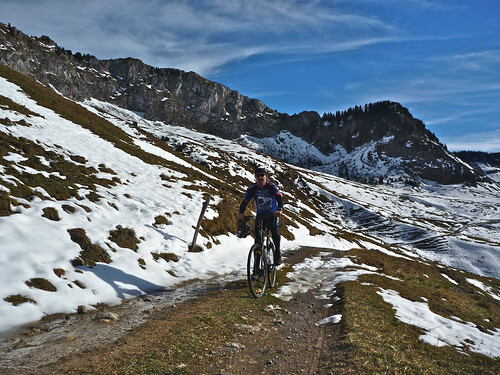 It’s not that much more than a couple of kms to the top – but occasionally very steep and at times quite a bit of snow. We had no idea if we’d be able to reach the top, but we were determined to try. I’ve marked the Col on the photo below, taken just before the turn off onto the farm road. My “theory” is that I can count a Col on my list as long as my bike gets there somehow. Next, we descended Chavan and retraced our tracks part way down Ramaz below the new tunnel. As the map shows there is a turn of to another little road that quickly becomes gravel. 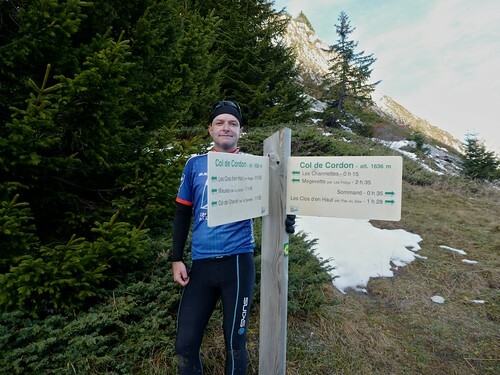 A fantastic trail through and then above a forest – and again, occasionally VERY steep. just hiked up. I guess it doesn’t count on my cycling list ;( . There looked like a couple of other roads to explore in this area – maybe next year. After Cordon it was mainly downhill back to the car following some pretty fantastic roads. Gravel up high and then paved for the last 10 kms or so. With the perfect November weather and a little snow around, this was a pretty amazing route. When I read your accounts I am green with envy! I was the chap who asked your advice about camping on the Madeleine and Ramaz for last years tour. We went but, to avoid divorce, camped at the municipal site in Taninges. We watched the 8th stage on the first hairpin down from the Col de Savoliere – where you had your beer! Couldn’t understand why Armstrong was a minute down but all became clear later. My wife got sick of the mountains on our way to The Madeleine, so we turned right at the foot of The Aravis and went to Albertville, change of plan and drove to camp at Bourg D’Oisans. Just got two rides in (family in tow), The Lauteret and Alpe D’Huez. Had only had a couple of three hour rides and occasional rides to work to fall back on – result sore knee on Lauteret & only a couple of k up The Galibier before turning back. Then 1hr 45 up The Alpe next morning. Used Mountain bike and slicks, cannot believe I used to race but enjoy taking it easy now! The original plan with the ride up the Lauteret was to go over the Galibier down the other side to climb the Madeleine and watch stage 9, bit off more than I could chew! Watched Jens tow them up the Madeleine from the comfort of the campsite television room! Gutted! Wish I could have joined you on the climb – the video looks great. 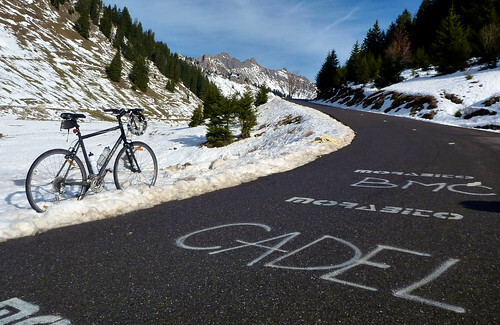 Planned to be on the Col D’Agnel this year then Galibier and a week at Taninges but possibility son may go to a fee paying school may put paid to it. 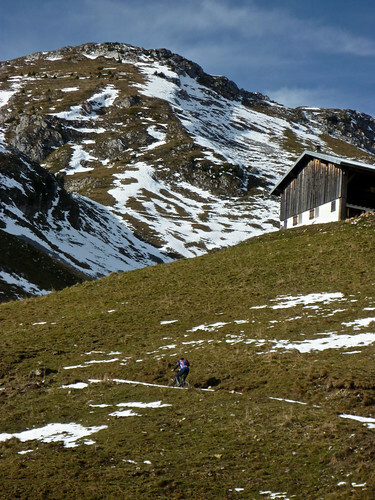 Might try for just a weeks camping at Taninges – want to do The Colombiere, Ramaz, Avoriaz & Joux Plane. 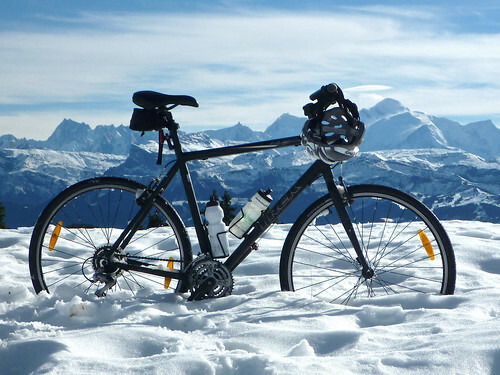 Flaine looks a good ride too! 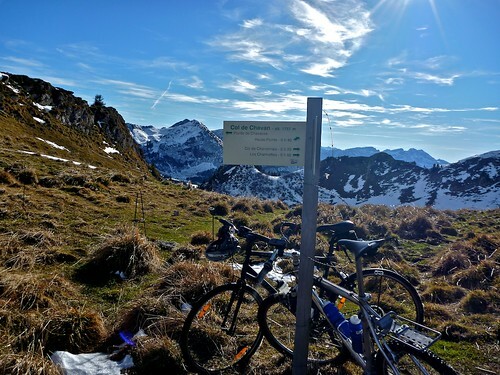 Love the details of the extra rides you did up on the Ramaz – love to try these one day. 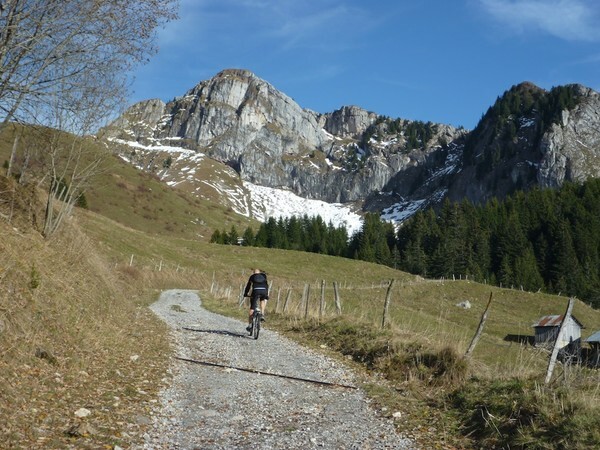 Also the ride near Aigle on the gravel road looks fantastic..If we were in the vicinity (and I was allowed off my leash!) and you were able to, would like to join you for a ride. As I say am green with envy you are able to do this so often! I may have to wait until my kids are teenagers before I can get fit enough to do a decent ride before they wake up (and my presence is required!). If by the gravel road near Aigle you mean the ride to Rionda, yes, that was one of the most spectacular rides we did last year. Would love to struggle up it again. If you are at Taninges, all the ideas you list are very good. 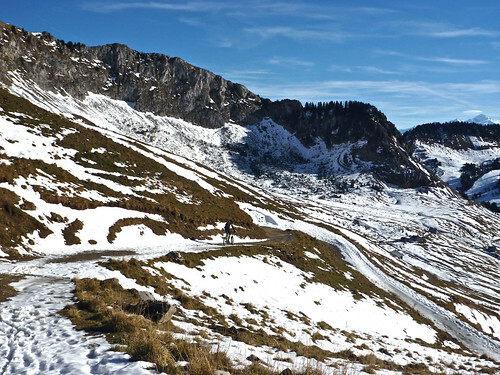 Also Col d’Encrenaz, Plateau des Saix, Col de la Joux Verte and Avoriaz are nearby and interesting. 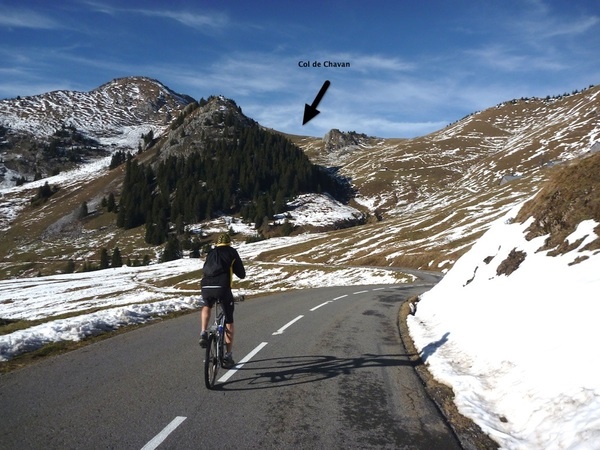 For mountain biking, have a look at the Col de la Golèse ride I did last fall. Amazing loop. Yes that was the ride I meant, love to give that a go. The thing with my state of fitness (or otherwise, really not riding much) is that on the road I’m getting passed by roadies on carbon rigs who dont say a word when they pass. Browns me off – I’ll always acknowledge another rider. What I like about the look of that ride is that I imagine you get real solitude up there, and won’t see empty ‘gel’ sachets lying everywhere like you see on the famous tour climbs! I’d looked at that gap between the mountains on the map and wondered what it would be like and can now see from your pics. 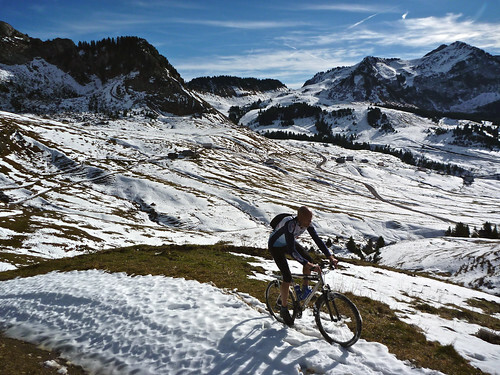 I’m just going to check out the other climbs you mention, and tonight saw your ride on The Colombiere in the snow, amazing.